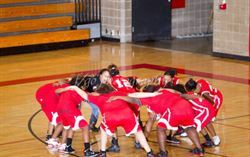 The Patriot Women's Basketball Team works hard on and off the court. 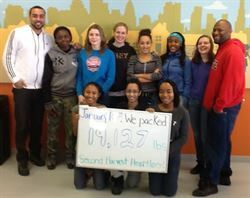 Read more about their trip to Second Harvest in early January. From Ms. Caprini, proud Patriot Parent: I was so impressed with the motivational words that Coach Lang, Coach Ron and Coach Kay brought to the girls at a Second Harvest at a weekend volunteer effort in January. Every bag that was packed related to basketball and the importance of team work. I mean this literally! We were a force in our workroom and had the least amount of waste than any other group and truly had the most FUN!!! Tuesday night, December 3rd the girls Varsity and JV teams beat Cristo Rey Jesuit. The Varsity team was lead by junior Dasharay Jones who had 28 points 27 rebounds 3 steals and sophomore Je'Nee Brown who had 12 points 12 rebounds 4 assists. It's a great start to the season, but we still have a lot of work to do, but the attitude on our team is phenomenal! See the Patriot Women Roster and Schedule here. Two years ago we thanked Seniors for their leadership: Raekhel Gray, Aviance English and Sha'Kiyra Jackson. Crystal Brooks '15 for Teammate of the Week for January 10th for her defense and 22 points against Community of Peace.